Bhubaneswar: Education is the Universal human right, said, Dr. Justice Dalveer Bhandari, Judge at the International Court of Justice (ICJ), The Hague at KISS on Sunday. On the occasion of Constitution Day Celebration in KIIT & KISS, he said, education has great contribution in social education. Education is special manifestation of human. A person without education is similar to animal. Poverty can be eradicated through education. In this context, I’m cent percent agree with Dr. Achuyta Samanta, Founder, KIIT & KISS. I have visited more than half of the countries of the world, but I have never seen institution like KISS anywhere. KISS is the miracle of world. Address the students of KISS he said, you have got huge opportunities here at KISS. You have to utilise these opportunities. Nothing is impossible in the world. Work hard to achieve goal, Justice Bhandari advised to the students. You have here a unique opportunity in education which is very important to your life so as to seek to understand the world surrounding us & the world where we live, said Justice Antonio Augusto Cancado Trindade, Judge at the ICJ. This is the goal persuade since the antiquity. After all life is brief and it is thus necessary to try to understand it in time and space. It is necessary to learn to live well along with the passing of time and to learn to live well in the space of the world where we stand. This is an ineluctable duty towards ourselves, those we love and those we live with. So as to render our existence is meaningful, he added. 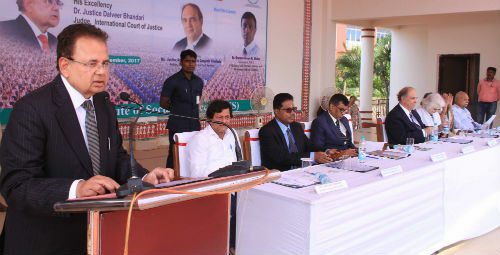 Addressing the Law students at KIIT Justice Bhandari said, Higher Education is the driving force of economic development. Development depends on education. University stands for humanism and tolerance. Education is a very important constituent of development of paradigm as without it the whole process of development is incomplete. It is important means to build our society in both civilized and peaceful manner, he added. Speaking the Law students, Justice Antonio said, the search for knowledge and understanding can’t be limited by self sufficiency of professionalization courses. The youth hopes to acquire knowledge so as to understanding the surrounding world and one’s own existence and to live with lucidity in one’s own time. We live now a day in any country of the world amidst the chaos, more or less institutionalize and amidst violence, indistinct degrees, he added. During this occasion an international Seminar on International commercial arbitration: a boost for world trade was organized by KIIT school of Law, where Prof. Martin Hunter, Professor, Nottingham Trent University; Prof. Steve K. Ngo, Chair of Asean Legal Alliance and P K Malhotra, Former Union Law Secretary, Ministry of Law and Justice, Govt of India deliberate various aspects of world trade and the importance of international commercial arbitration in this regard. Dr. Samanta gave the welcome address while R. N. Dash, Secretary KIIT & KISS proposed vote of thanks. Among others Saswati Bal, President KIIT & KISS; Dr. Dnyaneshwar Mulay, Secretary, Ministry of External Affairs and Overseas Indian Affairs Govt. 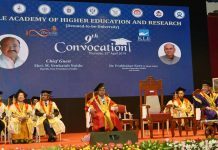 of India; Debraj Pradhan, Indian Ambassador to Norway; Padma Shree Dr. Subrat Acharya, Pro-Chancellor, KIIT; Prof. H. K. Mohanty, VC, KIIT; Prof. H. K. Satapathy, VC, KISS; Dr. Sasmitarani Samanta, Registra, KIIT University and Julius Lakra, Registrar, KISS also present on the occasion.